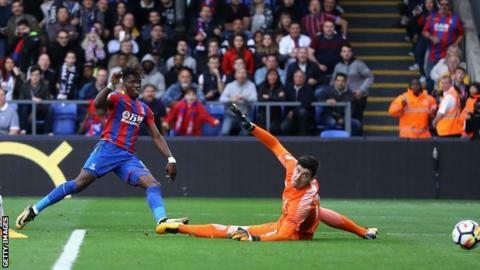 Crystal Palace manager Roy Hodgson says it would be "unfair" to expect Wilfried Zaha to single-handedly save the club from relegation to the Championship. The 24-year-old forward returned from a two-month injury absence to score the winner against Chelsea last weekend. Hodgson said Ivory Coast international Zaha, who has eight goals and nine assists since the start of last season, has been a "talisman". But he added: "It's not down to one man. It's about the team." Zaha rejoined boyhood club Palace in February 2015 after two years at Manchester United, for whom he made only four appearances following a £15m move. Palace, who remain bottom of the Premier League table despite ending a run of seven defeats with victory over Chelsea, travel to ninth-placed Newcastle United on Saturday. Hodgson said: "It's unfair to suggest that it's down to one man to get us out of the mess we are in. "If you asked me if he's a great player with a very bright future, who can only get better, I'd answer with a resounding yes." Hodgson warned his team to expect a "fanatical atmosphere" at St James' Park. He added: "They have started well and we have to be ready to give exactly the same performance as we did against Chelsea."